Signalment: “Max” 14y MN Boxer/Pit Mix. Weight: 62 lbs. History: Vehicular trauma in driveway on June 3, 2018. He presented with left-sided facial bleeding and swelling, and weight-bearing lameness of the left thoracic limb. He was diagnosed with a mandibular symphyseal fracture radiographically by the primary veterinarian. No other injuries or trauma diagnosed with full-body radiographs. Reviewed radiographs (was not submitted for radiologist review): subjective narrowing of C3-C4 and T1-T2 disk spaces, L7-S1 spondylosis, significant bilateral elbow osteoarthritis, mild bilateral carpal osteoarthritis. Bloodwork revealed mildly elevated ALT and ALP. Max was subsequently anesthetized and the mandibular fracture repaired with wire in figure-eight pattern. Medications sent home: Clavamox 500mg BID, Tramadol 50mg TID, Vetprofen 50mg BID, Gabapentin 300mg BID. Other history: pelvic limb ataxia for past 1-2 years – slowly progressive, but much worse after the trauma; chronic elbow osteoarthritis. Has been pacing and circling at night and seems restless. Acupuncture was recommended for both acute and chronic problems. Max has not had acupuncture or any complementary modalities before. Presented for consultation and acupuncture on June 24, 2018. On presentation, Max had an abnormal gait with low head-carriage, occasional crossing over of his thoracic limbs, dragging and intermittently knuckling in the thoracic limbs. He had whole-body ataxia with truncal sway. His elbows were bilaterally thickened and bowed-out. He had a stiff gait in the pelvic limbs with a wide-based stance and low tail carriage. The thoracic limbs moved asynchronously from his pelvic limbs and had increased rigidity in extension while he was laying in sternal recumbency. Neurologic exam: Alert and appropriate mentation. Prolapsed nictatans and miotic pupil OS with ptosis and enophthalmosis. Menace and palpebral response present OU. All other cranial nerves normal. Delayed CPs in all four limbs. 2+ patellar reflexes, withdrawals present in all limbs. Positive crossed-extensor reflex in thoracic limbs and pelvic limbs. Decreased ROM on lateral and dorsal cervical movement with hyperesthesia. Spinal hyperesthesia extending from the mid-thoracic to mid-lumbar region. Myofascial exam: Pain and myofascial tension of the lateral cervical muscles (omotransversarius m.), myofascial tension over the dorsal lumbar region, latissimus dorsi and long-head of the triceps mm bilaterally. Myofascial trigger points were palpable at the insertion of the trapezius muscle near the cranial border of the scapula. Taut bands and myofascial tension was palpated along the back from T3 to L3 with moderate discomfort. Other exam findings: Generalized muscle atrophy – more prominent over the left temporalis and masseter muscles, epaxial muscles and pelvic limbs bilaterally (gluteal muscles, quadriceps muscles). Heat was detected over the dorsal cervical and TL region. DDx: 1) CP deficits in all limbs and cervical hyperpathia – cervical myelopathy (r/o IVDD compressive vs contusion, trauma, hematoma, FCE, neoplasia, other); 2) progressive PL paresis (pre-existing to HBC) – r/o T3-L3 myelopathy, IVDD, neoplasia, degenerative myelopathy, other; 3) Horner’s OS – r/o preganglionic vs postganglionic, trauma/facial nerve paralysis, neoplasia, other; 4) bilateral elbow and carpal OA, chronic; 5) mildly elevated liver enzymes – r/o hepatopathy, benign nodular hyperplasia, cholangiohepatitis, ischemia, neoplasia, other; 6) increased pacing/restlessness at night – r/o cognitive dysfunction, intracranial disease, neoplasia, other. Dx: Caudal cervical myelopathy primarily on the left side; facial nerve injury with Horner’s on the left side; bilateral elbow and carpal osteoarthritis; pelvic limb paresis (progressive) – IVDD, or possible DM based on breed. Diagnosed caudal cervical myelopathy based on asynchronous gait, wide-based stance in the pelvic limbs, neurologic exam and myofascial palpation. However, the pre-existing pelvic limb paresis may also contribute to the wide-based stance and ataxia in the pelvic limbs. Horner’s syndrome and facial nerve injury based on clinical signs. Medical decision making: I designed my treatment plan to target the primary problem (caudal cervical myelopathy and facial nerve injury) as well as to treat the secondary or concurrent problems of bilateral elbow and carpal osteoarthritis, pelvic limb paresis, nonspecific hepatopathy and increased restlessness and pacing at night. My goal was to address the primary cervical spinal nerve points and neck pain with the BL, GV and GB points – BL 10, GV 14, lateral cervical regional points, as well as GB 20 and GB 21 for myofascial trigger points. I added LU 7 for the master point for head/neck and local carpal pain, as well as SI 3 for both local and cervicothoracic pain. For autonomic neuromodulation and anti-inflammatory properties, I used ST 36 to modulate the fibular nerve and nucleus tractus solitarius and LI 4 via the nervi vasorum. For the local back pain, I acupunctured BL 13 to BL 23 bilaterally and applied electroacupuncture for a few treatments weekly. I included BL 14 for the Back Shu point for the liver due to the nonspecific mild hepatopathy. For his elbow osteoarthritis, I used LI 11, LU 5, PC 3 and HT 3 bilaterally. Since he was reportedly pacing around and more restless at night, I incorporated some relaxation and central neuromodulation with GV 14, GV 20, Bai Hui, and Yintang. For his pelvic limb paresis and ataxia, I used Bai Hui, BL 40, BL 60 and KI 3 to aid in proprioception. To stimulate the mechanoreceptors and treat for thoracic limb and pelvic limb neurologic dysfunction, I used BaXie, BaFeng, Bai Hui and HT 8. For the treatment of facial nerve injury and pain, I acupunctured TH 17 and ST 4. Acupuncture treatment plan: Weekly acupuncture for 7 treatments (dry-needling and electroacupuncture). Central: GV 14, GV 20, Bai Hui. Autonomic: ST 36, LI 4, SI 3. Local: BL 1323, elbows (LI 11, LU 5, PC 3, HT 3), LU 7 (carpal and neck pain), BL 10, GB 20 and 21 (neck pain), TH 17, ST 4 (facial nerve injury), BL 40/60 and KI 3 for proprioception, HT 8 for thoracic limb neurologic dysfunction. Extra points: Yintang, Baxie and Bafeng. Needles: Seirin J-type needles of various sizes, Hwato (0.20 x 25mm), Carbo (0.20 x 13mm), Korean hand needles. Seirin 0.20 x 30mm for BL, GV, GB points and Bai Hui. Seirin 0.16 x 30mm or Carbo needles used for ST 36, elbow points, LI 4 and SI 3. Seirin 0.14 x 15mm for Yintang, HT 8, TH 17 and ST 4. After the first attempt at electroacupuncture with Seirin 0.20 x 30mm needles, I discovered that Hwato needles stayed in better than the Seirin needles and were less likely to fall out. Korean hand needles used for Baxie, Bafeng. 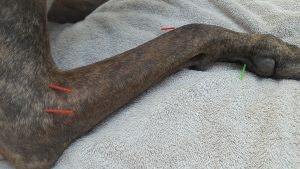 I performed acupuncture on Max for seven weekly treatments (there was one week the owner was not available between the 4th and 5th treatment and treatment was resumed on the second week). I used electro-acupuncture with the Ito-unit for 10-15 minutes per cycle on low (1.5 Hz) and high (150 Hz) based on the chart. EAP was used for a total of 3 weekly treatments on the 4th, 5th and 6th treatment. In hindsight, I would have preferred to do EAP every other week as sometimes he seemed a bit too stimulated and would pace around at night more per the owner. I would also have preferred to use laser therapy as another treatment modality with Max, however I do not currently own or have a unit to use. If I had a laser, I would have liked to target the cervical spinal region and facial nerve to treat the primary problem, and then use it over the elbows and back. ST 36, LI 4, and LU 7 were consistently sensitive points for Max, so if I had a laser acupuncture tip, I could have used that instead of dry-needling. For cervical and T3-L3 myelopathies and the facial nerve injury, I would use the 808nm wavelength at 1 J/cm2. For his elbow osteoarthritis, I would consider using a super-pulsed laser at 6-8 J/cm2. Ideally, I would start with 2-3 treatments per week and assess response. The goal of the laser therapy would be to reduce pain and inflammation, help stimulate growth factors and increase blood flow to areas that are restricted or have limited blood flow due to myofascial restriction or osteoarthritis. 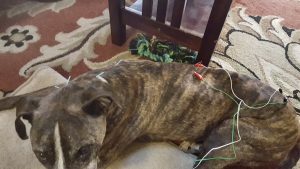 Max responded well to acupuncture and electroacupuncture. After the initial treatment, he got up and ran after a squirrel in the yard which the owner reported he hasn’t done in 2 years! By the 4th treatment, I could tell he was moving a bit more fluidly, although his gait was still very abnormal. Despite acupuncture treatment for facial nerve injury, he never regained function and continues to have persistent muscle atrophy and Horner’s on the left side. After the completion of 7 treatments, I could tell Max enjoyed his acupuncture sessions and seemed very relaxed. He knew when we would start his sessions and willingly laid down. Initially, he would start by lying in sternal recumbency with his thoracic limbs extended very rigidly in front. 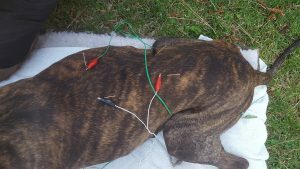 By the final few treatments, he was lying on his side and would close his eyes, sometimes even seemed to be falling asleep especially during the electroacupuncture treatment. He would rise up and get a drink of water and overall seemed to feel better after the treatments. His gait did not improve a lot, but I did notice by the end of his 7th treatment, he no longer had a positive crossed-extensor reflex and had conscious proprioception in his thoracic limbs. He still had delayed CPs in the pelvic limbs, but did not have any crossed extensor reflex in the pelvic limbs either. He also was still mildly ataxic with a low-head carriage, but he had increased ROM with his head without any noticeable pain and did not have as much cervical myofascial tension or heat. He still occasionally knuckled in the thoracic and pelvic limbs while he walked, but was able to fix it or correct himself faster when he stumbled and would normally have collapsed prior to his therapy. He did not cross his thoracic limbs when he walked as he did at the initial visit. 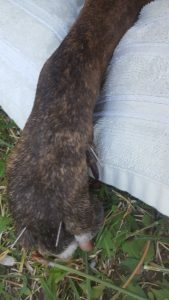 He still had somewhat of a carpal flip on the left side, mild weight-bearing lameness of the left thoracic limb and also a persistent low-tail carriage. 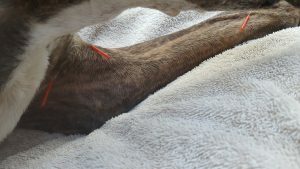 He had a follow up with his primary veterinarian in mid-July and radiographs revealed the fracture was not fully healed, therefore it was recommended to leave the wire in for another 4-6 weeks. He is scheduled to have the wire removed from his jaw the first week in September. 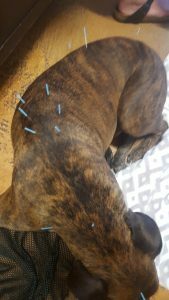 Overall, I learned that a 14-year old Boxer/Pitbull Mix that had multiple chronic issues and then sustained a vehicular-trauma on top of everything could really benefit from adjunctive therapy with acupuncture/EAP (and probably with laser too). 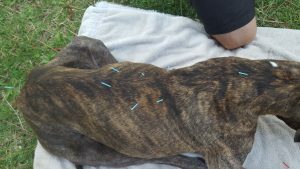 The owner was able to wean him off the carprofen right after starting acupuncture and only used gabapentin on an as-needed basis. He was also able to walk him about 10 minutes a day and by the end of the treatment, was able to take him on longer and further walks. 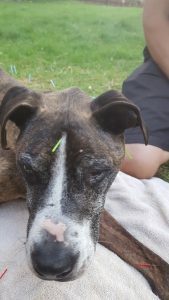 While many people may have elected to euthanize a 14-year old dog after it was struck or ran-over by a car, he wanted to give him a chance and see if acupuncture would be able to improve his quality of life and I truly believe that it did.